It is always interesting to get insights into how other artists work, their approach to creating art and their thoughts about the process. Perhaps it is just a feeling that one might be walking the same path, or maybe that one can learn from some someone else's experiences. I found that there is a great deal to learn from a wonderful exhibition currently on display in Barcelona at La Caixa Forum, Delacroix, de la idea a la expresion, an exhibit that runs until May 20th. It is a huge, well curated exhibition done in conjunction with the Louvre, with works from collections in North America and all over Europe. One of the main aspects of the show really addresses this issue of how an artist conceives of a work, and how it eventually turns out. I found it fascinating, for the highly talented, young Delacroix was always wrestling with the tension between the ideas that he had for paintings, mostly inspired by literature, political events or legends when he was young, and their execution. Eugene Delacroix even kept lists of ideas that he had for paintings and worked from these lists throughout his life, using them sometimes almost as talismans against the absence of inspiration. This tension between concept and completed work caused Delacroix much thought, and it was a subject he revisted often during his life. Writing in 1822 about painting and poetry (his early love was poetry which he forsook to be an artist), he observed that, "When I paint a good painting, I am not writing down my thoughts". He was very aware of that mysterious bridge that a painting builds between the artist, the soul of the painting and the viewer, a subtle, intimate dialogue. Yet Delacroix often caused a great deal of controversy, especially in his early days as an artist. He was highly successful, yet his work was frequently vilified by the public and critics for the way in which he executed the painting. An example of the scandal he created was his 1827 painting, The Death of Sardanapalus, a huge work that harks back in energy and colouration to his hero, Peter Paul Rubens. 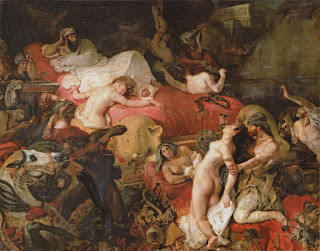 Delacroix' original concept for this painting was, as documented by his Journal, inspired by the shock of reading about the despot, Sardanapalus, in Byron's poem. He devised a painting that was to be ferocious and somber, but in truth, that deviated from Bryon's account and the original accounts of Sardanapalus. I am sure that every artist, having thought of a theme and concept for a work of art, sets about its execution, only to find that the results differ, sometimes widely, from the original idea. I know that it certainly happens to me, and I find myself looking with dismay and/or surprise at what has been produced. It is then somewhat difficult to judge if the evolution from idea to result has been positive or negative. Only time tells one the judgement. Delacroix, I am sure, found out the same thing as the public reacted to his paintings that had undergone quite an evolution from concept to completion. Happy New Year to everyone! May 2010 be a wonderful year for all. As I watched the New Year come in under a brilliant full moon shining over Palma de Mallorca, I could not help but think that this decade would probably be as full of radical changes in the art world as in all the other domains, be they financial, technological or environmental. Each of us, as artists, is constantly trying to think of new and better ways to approach the creation of art. However, one of the most interesting - and metaphorically eloquent, perhaps - ways of creating art has been flowering in the United States and and further afield: the framed reproduction of your personal DNA. On sale on the Net, adorned with jewels or other items to your taste, the DNA picture seems to me to be emblematic of our lifestyle tastes of today. Good or bad - who knows? It is certainly a very personal piece of art that you can put on your walls. 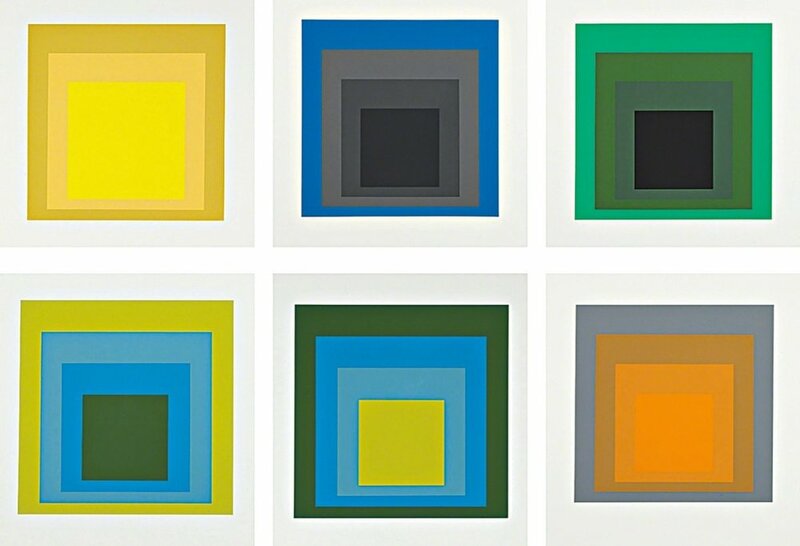 I was looking at an example of this art in an illustration I saw in the Diario de Mallorca last week, and could not help thinking of Josef Albers and his use of colour theory. Perhaps the DNA pictures could be allied to his sense of colour. The history of colour theory is enough to make any artist dizzy, but it does reward by study! Not only the history of the use of colour, but the history of paint pigments themselves make for the most fascinating reading. Having wandered into the world of pigments, artists often then get totally hooked on learning more of the dramatic stories behind the pigments' productions and discoveries. An enthralling book which I read when it came out in 2001 is Bright Earth. Art and the Invention of Color by Philip Ball, published by the University of Chicago Press. Having learned about pigments' histories, I had a far better appreciation not only of the paints I use when I am painting in watercolours, but every painting I view in a museum has an additional layer of interest as I look at the pigments the artist used. I wonder if that will be said, ten years hence, of the DNA pictures that are increasingly adorning people's walls. Any bets on this aspect of the future art world?